Irish animals will be particularly vulnerable over the coming days as Storm Emma approaches Ireland. Met Eireann are preparing to issue a status red weather warning, its most severe, as the country braces itself for plunging temperatures and up 40cm of snow in some areas. The Irish Society for the Prevention of Cruelty to Animals (ISPCA) has shared a number of tips for Irish pet owners to ensure their animals remain safe during the cold snap. "Consider bringing your dog for more frequent shorter walks to avoid being outside in the cold for too long," ISPCA public relations manager Carmel Murray said. "Especially some smaller, thinner and older dogs as they have a harder time keeping warm and may be a little reluctant to head out on very cold days. You might consider a dog jacket to keep them warm. Also it is important to bring any outside dogs indoors in very cold and wet conditions." 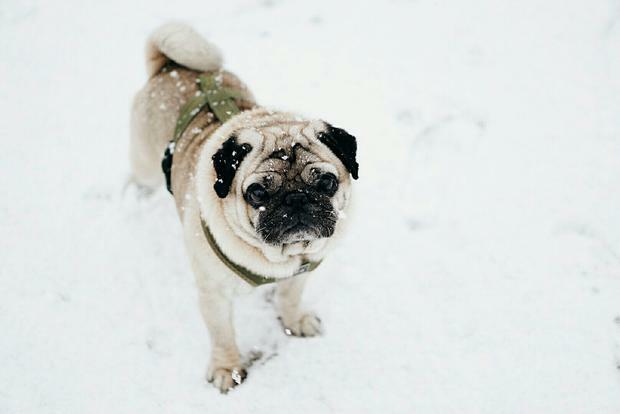 After a walk, it's important to ensure your pet's skin (and paws) are completely dry, ensuring there is no salt or de-icing chemicals on their paws, which can cause sores. Additional advice includes ensuring your dog is on a lead, they are microchipped, as required by law, and if you are concerned, to contact your vet immediately. With cats, owners are being asked to consider allowing them indoors more over the coming days, even if they are primarily outdoor cars, and locking them at night for their safety. "Cats are great at finding warm spots to sleep, but sometimes these can be dangerous, like under the hood of a car so make sure to check your car for sleeping kitties before you drive," the ISPCA says. "You could also provide a clean, dry outdoor shelter with bedding for them to use during the day. When your cat comes in from outside, wipe them down to take off excess water, salt, or grit, and make sure they don’t have any anti-freeze on their paws." Horses, ponies and donkeys need good shelter for example a warm stable or purpose built shelter, as temperatures are expected to plummet to -6C with snow showers in some parts of the country. You should also check their drinking water has not drozen. "Most horses and donkeys need to be rugged to protect them in cold and wet weather and it is important to check their rugs every day to ensure they are correctly fitting and not damaged," they add. "It is also important to check water feeders daily ensuring their drinking water has not frozen. Even heavier coated ponies can suffer from rain scald. It is also very important that all equines have a dry hard surface to stand on. The thin skin around their legs is also highly susceptible to mud rash if they spend too long standing in wet muddy ground without a dry area to escape to."